I'm using Nexys Video FPGA dev board. Receiving input video stream via HDMI, saving it on DDR3 memory, reading back and transmitting over HDMI. Design works, tested with different resolutions etc. But today I powered my Nexys video board and computer didn't find any connected HDMI, even worse, HDMI from PC could't detect any monitor. I suppose it's broken. Consulted with my collegues and same problem appeared with them - twice. My question, did any of you experienced same problem? if Yes, did You solved it and how. Are you able to use a verified Nexys Video project? Please load this project here. This project is a verified HDL Nexys Video OLED Demo. If the OLED project works please load the HDMI Demo here. It is a verified HDMI project. No i'm using self made project. Solution: power off PC, after 5min powered on and HDMI was back. My question was more about - if anyone had troubles that Nexys Video board input HDMI damaged source, for instance PC!? Because to us it happened 3 times and one of them was broken completely. this isn't specific to any particular card, but in the past there have been problems with HDMI reverse biasing. That is, a situation where it is unclear which device is allowed to supply voltage at what time. To clarify did the PC HDMI port or the Nexys Video HDMI source port get damaged. Also care must be given with HDMI cables. You want to power on the Nexys Video before connecting the HDMI of an already-on device. As well as either disconnect or power off the connected HDMI devices prior to turning off the Nexys Video. I have personally turned off my Nexys Video and not the Monitor and found the Monitor was powering the Nexys Video through the HDMI cable. To ALL. Read the Series 7 Select IO reference manual. HDMI uses the TMDS_33 standard which requires 50 ohm pull-ups to 3.3V on the terminus end. TMDS is a current sink and not a current source, similar to open-collector ( open-drain ). While the FPGA pins may power up in a high impedance state before configuration there is nothing preventing external devices, such as a monitor, from driving current into your FPGA board power rails while the board is un-powered. The HDMI port isn't the only means to create this kind of problem. This is why anyone connecting an external circuit to FPGA pins needs to understand the IO buffering configuration before powering their equipment. it would be nice for FPGA board vendors to alert users to the issue but ultimately it's the user who has to be aware of what they are using. For all logic standards is is certainly possible to design hardware that safely meets a particular interface requirement such as HDMI, that presents the possibility of connection issues, but the cost may be prohibitive. Problem was with PC HDMI. Yes, I'm always connecting hdmi before powering up Nexys or even PC. Thanks @Zygot, for the hint I'll definitely read this information! I am also getting the same problem. I am able to change the resolution of the screen and reproduce the frame patters but when trying to input the HDMI in I get a strange screen as can be seen in the photo (I was expecting to see the desktop instead). When I connect back the HDMI from the computer to monitor everything works fine. In the wiki for the Nexys Video HDMI project here it describes the different option you can choose from in the serial uart menu. Please attach screen shots/pictures of what options you are selecting and the result on the monitor. Actually, the HDMI project works fine for functions 1-5. The screenshot in my previous comment is related to function 7 in the uart menu. It does not input the HDMI in, just a strange pattern. I tried to reset it a couple of times and before of getting that image I got a blank image (when selecting function 8 it turned onto black). I checked that the HDMI cables are working (at least to output the video to the monitor). To clarify the HDMI-IN and HDMI-OUT ports only have the physical hardware to do the one named task I.E. 1) HDMI IN or HDMI OUT. Do you have the in coming hdmi from the PC connected to the HDMI-IN port on the Nexys Video along with the HDMI-OUT on the Nexys Video connected to the monitor? 2) There is a potential to back power the Nexys Video through the HDMI ports. To avoid any power up issues or potential damage make sure that the either the HDMI devices connected to the Nexys Video are not powered on or that the HDMI cable are not connected to the Nexys Video before fully powering on the Nexys Video. 1. Yes, they were connected properly. 2. I am not pretty sure if there is any damage to the HDMI ports in and out. The first time I connected the cables the FPGA was turned off, but the monitor might be on. Have you tried making sure the resolution is the same between the HDMI input and the HDMI output? I have tested the user demo in the following way: one HDMI cable from PC to HDMI in in the FPGA (J9) and another HDMI cable from HDMI out (J8). The internally generated pattern works fine but I am not able to get the pass-through buffer. 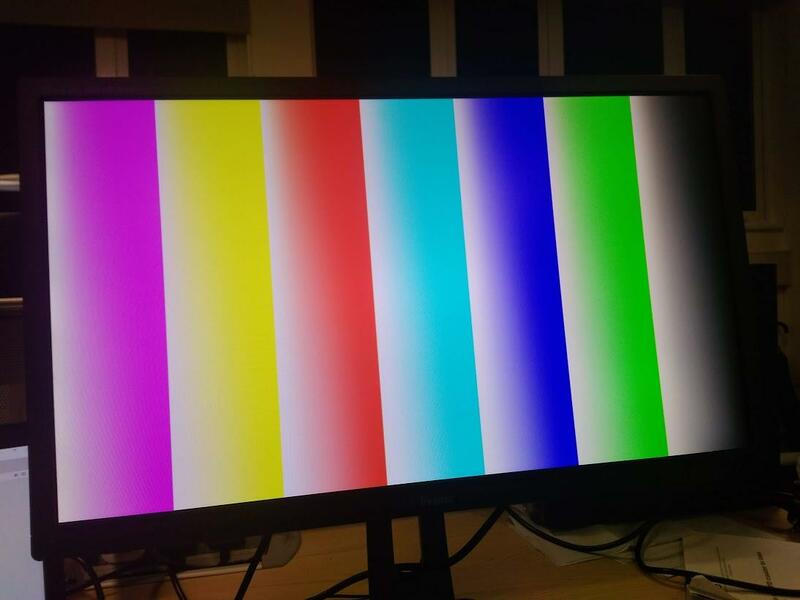 Is there a sign for damage in the HDMI port on the FPGA or should I use another cable instead of HDMI to HDMI? 1) Before trouble shooting the HDMI hardware I would like to verify that when you are turning on and configuring the Nexys video the HDMI cables are dis-connected. After you have configured and programmed the Nexys Video in SDK you are connecting the HDMI cables. 2) Does the serial terminal menu change from unplugged to plugged in showing a resolution? 3) Is the resolution of the input HDMi signal the same as the output HDMI signal? 4) It might also be prudent to download Vivado 2016.4(you can have multiple versions downloaded) and try the Nexys Video HDMI project in the original Vivado version it was made for.